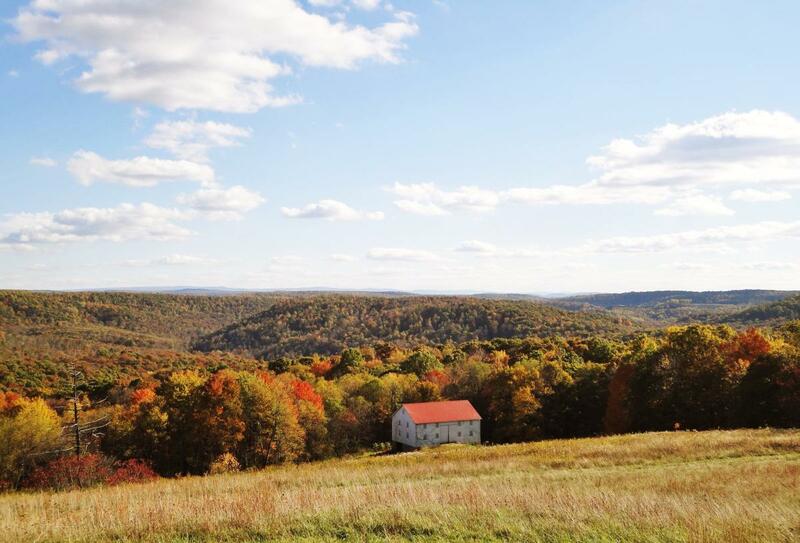 For the perfect fall outing, take a ride through the region’s colorful rolling hills, deep river valleys and the highest peaks in the Laurel Highlands. Make sure to bring your camera for some stunning snapshots! Stop at picturesque covered bridges for a one-of-a-kind landscape view of Southwestern PA with the background of colorful leaves. Here are some suggested routes and not-to-miss attractions along the way. Greenhouse Winery: With a great lineup of events continuing into early November, Greenhouse is a not-to-miss stop. Enjoy a tasting and pick something to make your taste buds happy from their 20 delicious flavors. Twin Lakes Park: Extensive stone pathways wind around these picturesque lakes, the perfect place for a pleasant fall walk. Lincoln Highway Experience: Learn about the history of coast-to-coast transportation on Route 30 through cool exhibits at the Lincoln Highway Experience and enjoy a slice of pie at Serro&apos;s Diner. Ligonier: Stop for a delicious meal at one of the many fantastic restaurants, a scoop of ice cream at the famous Ligonier Creamery or a pick-me-up from Abigail’s Coffeehouse. After you&apos;re full and energized, take a stroll around the Diamond and spend some time the unique boutiques and antique shops. Continue on 30 and take the optional scenic detour to Linn Run State Park. This drive will take you on the section of 381 that winds through Rector and is one of the most scenic drives in all of the Laurel Highlands. Wind down country roads through private estates and farmlands, admire the tree-lined split rail fences and expansive views of the rolling Pennsylvania hills. At Linn Run, be sure to make a stop for the short hike to Adams Falls. You can even drive past the park, through Forbes State Forest to Laurel Summit State Park, where the pavement becomes a dusty gravel road. There you’ll find the trailhead for the three-mile hike to Wolf Rocks Overlook, another incredible vista for leaf-peeping, as well as the short walk to Spruce Flats Bog. Just a little drive further will take you to Beam Rocks Overlook, a short half-mile hike that leads to an equally impressive view. Laughlintown: Enjoy a scrumptious treat from The Pie Shoppe. Jennerstown: Stop at the Coal Miner’s Café for a delicious meal to refuel you for your road trip. Flight 93 National Memorial is just a few miles from the main highway on Lambertsville Road. 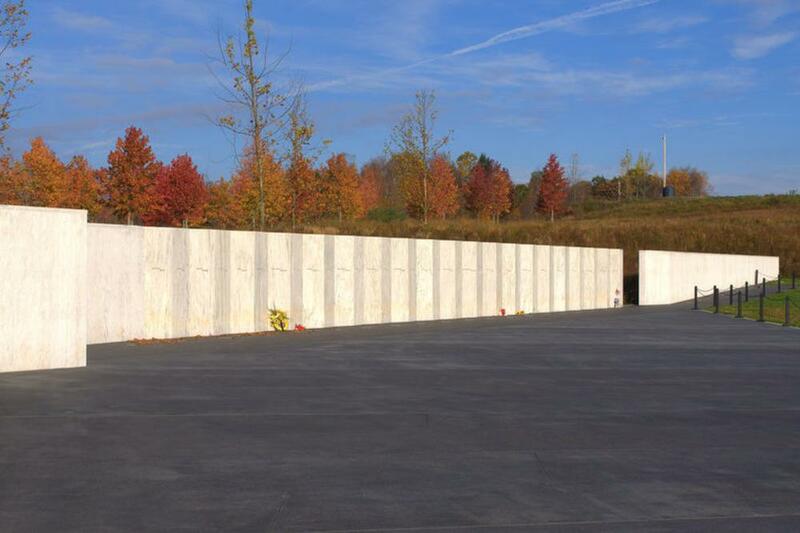 Pay homage and remember the brave passengers of Flight 93 who gave their lives on September 11, 2001. 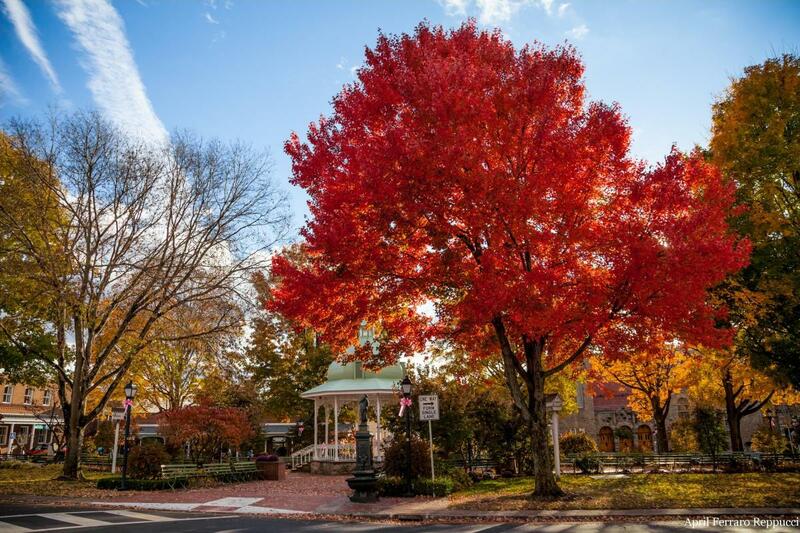 Ligonier: Make a stop to take a picture of the bandstand on the Ligonier Diamond surrounded by the color-changing leaves. Powdermill Nature Reserve is an excellent stop for families interested in the natural world. They offer educational programming and exhibits as well as more than 2,200 acres of wildlife. Ohiopyle State Park: The Youghiogheny River, the busiest section of whitewater east of the Mississippi, runs through the park’s 20,500 scenic acres. With waterfalls, vistas, nature areas and over 80 miles of trails, Ohiopyle is the place to be for year-round adventure. In central Ohiopyle, you’ll find the Falls Area Visitors Center, with educational displays and an expansive view down the river. Central Ohiopyle, a charming town, offers several delicious dining options and shops full of unique gifts and goods. Fallingwater®: Frank Lloyd Wright’s iconic masterpiece is even more breathtaking and impressive when framed by the colorful fall leaves. If you don’t have time for a full house tour, a grounds pass is worth the stop. Kentuck Knob: One of four Frank Lloyd Wright homes in the Laurel Highlands, Kentuck Knob sits on a mountain at 2,000 feet above sea level. The home features no right angles and embodies Wright’s organic architecture concept. Kentuck Knob is also home to a fantastic sculpture garden and a lookout with an amazing view. Nemacolin Castle: Take a walking tour of this fine house museum, featuring rooms with historic Bowman family furnishings dating back to the late 1700s. Seasonal tours are offered only during the fall. Christian W. Klay Winery: The highest mountaintop vineyard east of the Rockies, Christian W. Klay Winery pairs a wonderful view in addition to their impressive wine collection. For those who prefer liquor, you can also find Ridge Runner Distillery at the winery. We recommend trying their unique moonshine. Summit Inn Resort: Relax during your stay on the grand veranda and look out over the valley from Chestnut Ridge. Laurel Caverns: Open from May through October, Laurel Caverns is a natural calcareous sandstone cave. Take a tour of this natural wonder, go spelunking and play a game of mini golf in a simulated cave. Greendance – The Winery at Sand Hill is a picturesque winery that sits just a few miles off 31 in Mount Pleasant. The grounds are ablaze of color in the fall season, ideal for a tasting of their fantastic selection of fruit and grape wines in the garden. Nino’s Restaurant: Just a short drive up the hill from this divine restaurant is an incredible overlook. On a clear day, you can see Pittsburgh in the distance. Donegal: Here you’ll find Out of the Fire Café, a restaurant with an impressive view to match the impeccable cuisine. Be sure to stop in Old General Store and Country Pie Shoppe for a sweet treat to enjoy on your road trip. 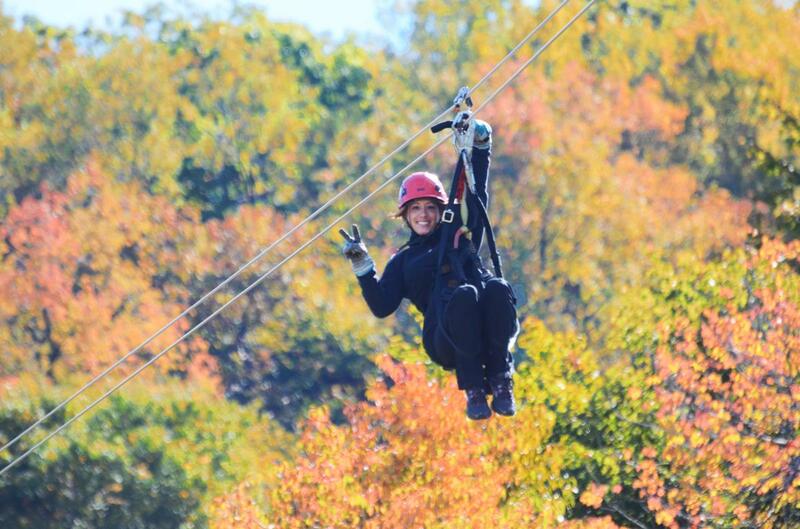 Take a detour on County Line Road and make the drive to Seven Springs Mountain Resort, where there&apos;s no end of fall festivities, from Autumnfest to the Laurel Ridgeline Zipline Tours. Kooser State Park: With one-and-a-half mile of walking trails, Kooser Lake and Kooser Run make an excellent spot for fishing and leaf peeping. Glades Pike Winery: Take in the view of the beautiful fall foliage from the deck or gazebo with a glass (or bottle) of wine.